Is the Senate scandal a supercharged change management tactic? I’m appalled by the antics in Ottawa right now. They erode trust faster than a wave on a sandcastle. But I want to know why it’s happening. Why did the Conservative government draw attention to Senate expenses now? They had to know about lax and unequally applied regulations. They had to know that funding improprieties would draw questions about why the majority party has not made good on a party platform to abolish the Upper House. Despite the sensationalism, why the focus on relatively small potatoes? Contracts for F-35s are worth $25 billion over 20 years. Cancelled gas plants in Ontario are in the neighbourhood of $500 million. Those are big scandal dollars. In the case of the Senate expense scandal we’re talking about $90,000 – $100,000. The audit has to cost more than that. We have to ask: Why would a political party do this to itself? Why would it throw its own appointees under a very public bus? No one looks good in this scenario. Is it entertainment? Is it fiction “inspired by true events”? Initially I wondered: While we’re watching the drama unfold, what else is happening? Are the expense allegations, backroom deals and “he said-she said” political prestidigitation – slight of hand to divert attention from something bigger? What is the Senate expense scandal hiding? Is it designed to change a conversation? This is a government that has been masterful and ruthless in controlling its messaging from its first days as a minority government in Ottawa. There’s no reason to believe they would change their approach now. Is Stephen Harper the Wizard of Oz behind the green curtain? Did he orchestrate the debate that has been raging for months? News reports are attracting crowds of Canadians around airport televisions. Office water coolers are buzzing with opinions. I’m all for public policy debate and interest in our political institutions. I think Canada needs far more of it, especially on constructive issues, but this feels off. Then I remembered the first step of Kotter’s change management model: Establish a sense of urgency. Is it possible that the Senate expense scandal is designed to spark public outrage over amounts that people can relate to? Then, the Conservatives could swoop in and communicate their vision for change, i.e., abolish or reform the Senate and build on the momentum. Is it possible the accused Senators are collateral in a massive political drama/ communications tactic intended to manipulate Canadians? It wouldn’t be the first time that politicians created what psychologists call a “felt need for change.” In 1997, then minister of education and training, John Snobelen, was caught on video telling staff that “we need to create a crisis in education” to condition the electorate for major change. I’m sure other examples abound. I don’t object to use of a proven change model. I’d argue it’s only ethical when it is an honest, transparent demonstration of compelling facts that move people to seek change. I applaud it if it prompts public policy debate that is about exploring ideas and not about tearing down people. I object when the “felt need” or “establishing a sense of urgency” is a red herring. I am outraged when the tactic erodes trust in our elected officials and in our institutions. The only possible bright side? People had to find out who their MP or Senator is and perhaps gave them a call or dropped them a line. I hope I’m wrong. I’m not sure when I became such a cynic. For the record, I worked on Parliament Hill for years as a House of Commons page, a tour guide and a Parliamentary intern. I’m a fan of the Senate. The intent of the Upper Chamber is to represent regions and to balance the “representation by population” of the House of Commons. The Chamber of sober second thought is intended to introduce its own legislation and to study legislation sent to it from the House of Commons. 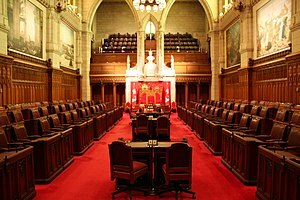 Senators are not elected because the diverse group esteemed Canadians are supposed to tackle politically sensitive issues like euthanasia without the pressure of electoral cycles. But we’re being served a caricature of the worst stereotypes and it makes this girl wonder. ← How do you create a sense of urgency without scaring people? Dominique, being from the U.S., I know little about Canadian politics. I found your post most informative, and a valuable supplement to the daily news. Thanks for taking the time to share. Thanks Robert. Our respective countries each have their fair share of scandals don’t they? I think we’d see a universal improvement if people just acted with more integrity. I’m all for citizen engagement but our civic energy is being sooo misdirected!